Bhutan with its capital Thimphu is located in Asia (Southern Asia, between China and India). It covers some 38,395 square kilometers (slightly larger than Maryland) with 758,288 citizens. Dzongkha is the official language used in Bhutan. As an interesting fact, is sharing borders with China and India. Bhutan is a small country in the Himalayas. In terms of average wage, Bhutan is a poor country, however the land is fertile and the population small, so the people are well fed, and beggars and homeless are nonexistent, except for few. In addition, the current generation receives free education, and all citizens have access to free medical care. The kingdom became a parliamentary democracy in March 2008 upon the command of the Fourth King. The official name for the country is Druk Yul - Land of the Thunder Dragon - but due to the harmonious nature of the society, it has acquired the additional nickname of Deki Druk (Yul) - (Land of) the Peaceful Thunder Dragon. Although the country expanse is quite small Bhutanese weather varies from location to location mainly depending upon the elevation. The majority of tourists do cultural tours where they visit important destinations in a vehicle. This allows maximum coverage of the country within a limited period of time. To reach someone Bhutan dial +975 prior to a number. The local cellular networks are operated on 900 MHz, 1800 MHz, 3G, 4G. Websites typically end with the top level domain ".bt". If you want to bring electric appliances (e.g. battery chaarger), keep in min the local 230 V - 50 Hz (plugs: C, D, G). The sign for the locally used currency Ngultrum is BTN. 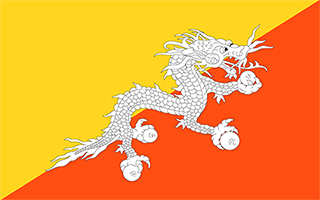 Divided diagonally from the lower hoist-side corner; the upper triangle is yellow and the lower triangle is orange; centered along the dividing line is a large black and white dragon facing away from the hoist side; the dragon, called the Druk (Thunder Dragon), is the emblem of the nation; its white color stands for purity and the jewels in its claws symbolize wealth; the background colors represent spiritual and secular powers within Bhutan: the orange is associated with Buddhism, while the yellow denotes the ruling dynasty.